Nations Press health CELLPHONES TRANSMIT RADIATION THAT WILL HARM YOUR HEALTH!-MUST KNOW!! CELLPHONES TRANSMIT RADIATION THAT WILL HARM YOUR HEALTH!-MUST KNOW!! Dr. Devra Daivs has been researching the hazards of radiation emanating from your cell phones. With the toxicological and epidemiological evidence in her hands she has proven that the cell phones are not only dangerous, but they can also be lethal for you. It is due to the erratic nature of the signal and its ability to disrupt resonance and interfere with DNA repair. Her theory is believed to be the most plausible for understanding the wide array of health impacts discovered including cancer. One lady, that had no predisposing risk factors for cancer, had a bad habit to carry her cell phone in her bra. After some time doctors revealed breast cancer.It may serve as a warning to all people who keep their phones in their pockets or places near their body as radiation exposure within 6 inches is very dangerous. 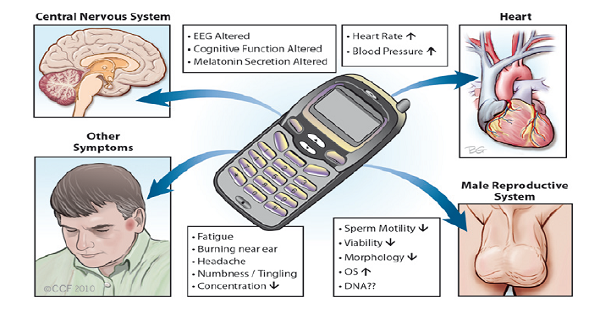 According to a research published in 2009, men who carried their cell phones on their belts (15 hrs/day, 6d days/week) had their bone mineral density lowered on the side of the pelvis where their mobile phones were carried because of the emitted electromagnetic fields. While another research proven that it affects men’s sperm and its quality too. Another study by Dr. Siegal Sadetzki from Israel explained that you have a chance of getting salivary gland tumor (located on the place where you hold your cell phone) and the risk can be increased if you use your phone regularly for 5 years (34% of risk), you had more than 5,500 calls in your lifetime (58%), spoken on your phone for more than 266.3 hours during your lifetime (49%). The World Health Organization/International Agency fir Research on Cancer issued a report back in 2011 that these devices might cause brain cancer, thus people should try to avoid using it as much as possible practicing texting or using hands-free devices. You can protect yourself and your children by minimizing your exposure to electromagnetic radiation from your cell phones and other devices which are wireless. Children should not use a cell phone or other devices of this type. Avoid using your phones as well and switch to the land lines at your homes or work. Further, do not consider having any of these devices in your bedroom as they interfere with the quality of your sleep. Use your phones where reception is good since low reception uses a lot of power which emits more radiation.